Artist r1. is helping to create awareness of the massive problem of plastic bottles - and the resulting environmental pollution on both land and in the sea - with an environmental art project that has transformed over 7,000 plastic bottles into a 20-meter-tall permanent art sculpture called the iThemba Tower. Reaching towards the sky in Troyeville Johannesburg, it symbolizes both hope and inspiration. A redundant communications tower was used as the base of the iThemba Tower, which derives its name from the Zulu word meaning trust or hope. The local community was involved in all aspects of the design process, from plastic bottle collection through to construction. 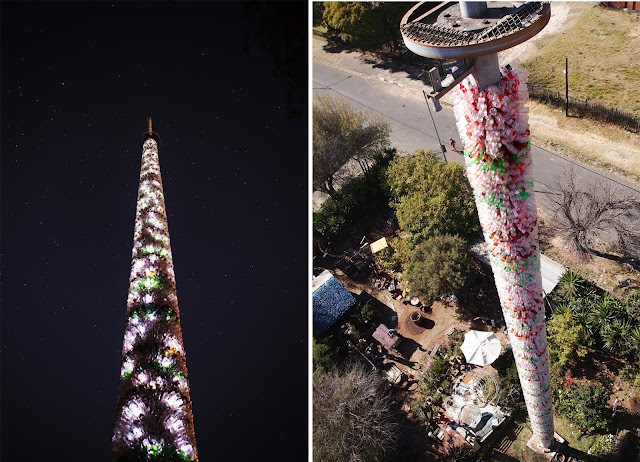 Locals were also invited to fill each bottle with a 'message of hope,' thus creating a symbolic communications tower that 'broadcasts' the community’s diverse hopes and dreams. 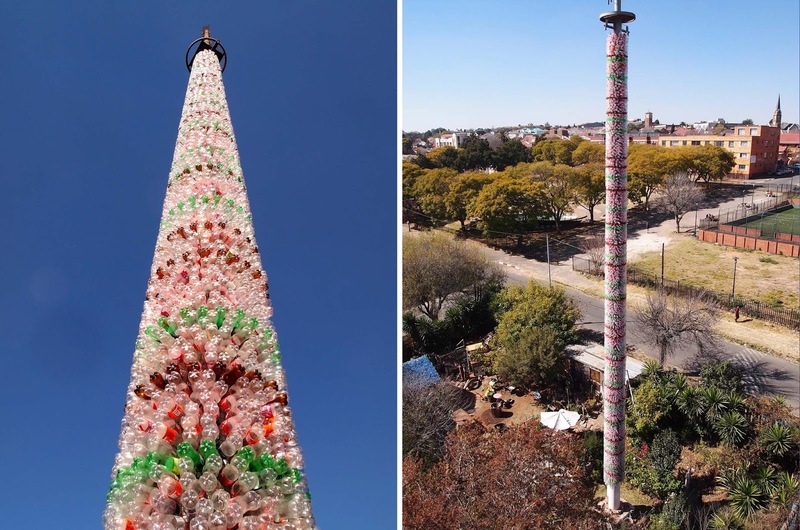 “It is estimated that in South Africa alone, nearly over 250,000 plastic bottles are dumped into our environment every hour,” says the narrator in the video below about the iThemba Tower. 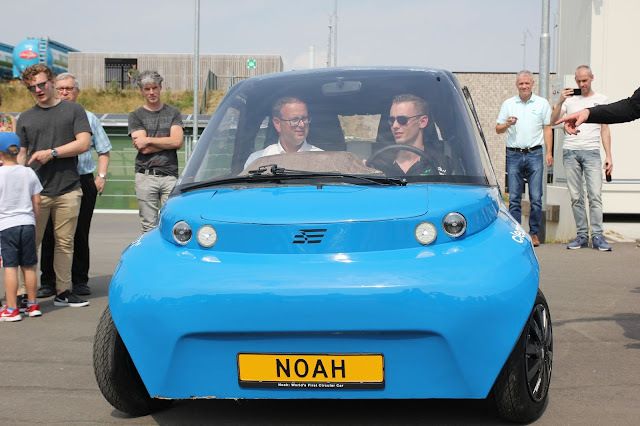 “One plastic bottle will take up to 700 years to completely break down in a landfill. The iThemba Tower project raised awareness the importance of recycling through workshops and various community activities.” LEDs were also inserted inside the bottles to turn them into “lights of hope.” The lights bring the tower alive at night and create a magical twinkling effect. 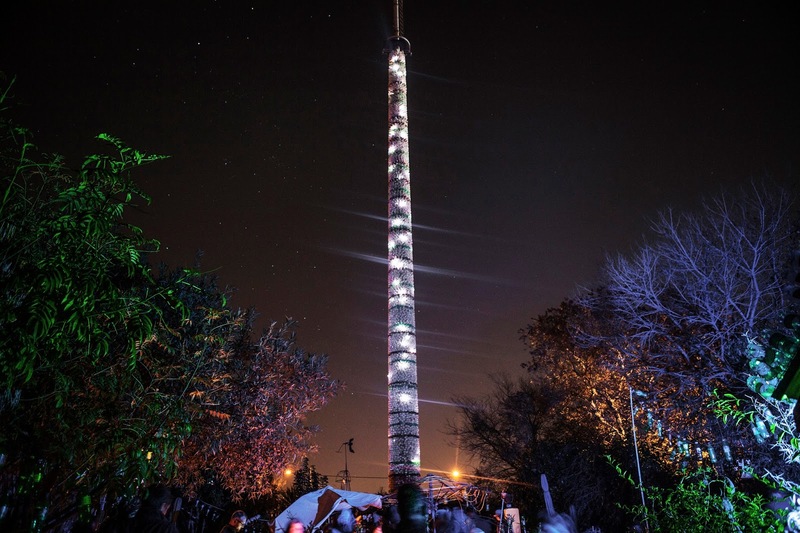 The iThemba Tower is a permanent art piece at the Spaza Art Garden, a safe haven for creatives in Johannesburg. With a million bottles a minute being produced, the world’s plastic bottle consumption has been called ‘as dangerous as climate change.’ The statistics are astounding: More than 480bn plastic drinking bottles were sold in 2016 across the world, up from about 300bn a decade ago. If placed end to end, they would extend more than halfway to the sun. 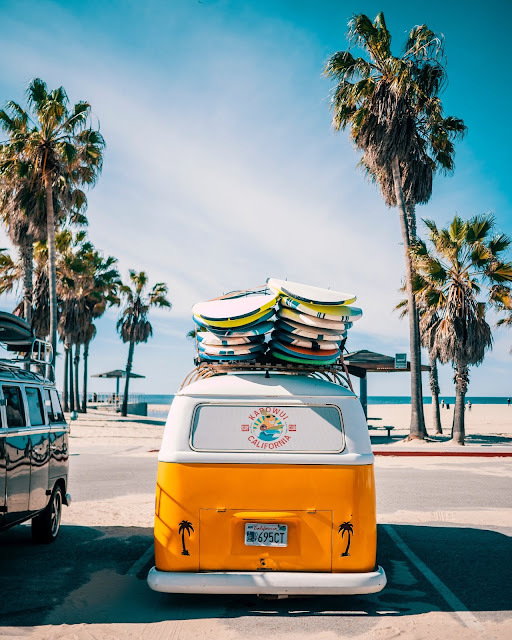 By 2021 this will increase to 583.3bn, according to Euromonitor International’s global packaging trends report, far more than the global recycling infrastructure will be able to cope with. Beyond the issue if the recycling infrastructure is the one of collection. Fewer than half of the bottles bought in 2016 were collected for recycling and just 7% of those collected were turned into new bottles. Most ended up in landfill or in the ocean, contributing to the 5m to 13m tons of plastic that leaks into the world’s oceans each year to be ingested by sea birds, fish and other organisms, leading to the horrifying statistic from research conducted by the Ellen MacArthur Foundation that by 2050 the ocean will contain more plastic by weight than fish. Ellen MacArthur Foundation Environment Environmental Plastic bottles Pollution r1.